If you want to improve your home’s comfort level, call 281-704-3696 today for radiant barrier services in The Woodlands. It’s a quick and affordable solution. We will set up an appointment for one of our experts to visit your home and install a radiant barrier that will last for years to come. Visit our coupons page for deals and discounts - click here. When you consider how hot it gets in Texas, it’s easy to understand why cooling costs may be high. Having a cool, comfortable house is a must for most residents, and there are several different tips and techniques that can help keep the cool air inside. Having a radiant barrier installed in your attic is one way to keep the indoor temperature at an acceptable level while saving money on your cooling bills. Click here to discover what your neighbors in The Woodlands, TX are saying about our HVAC services. A radiant barrier refers to a material added to your attic that is highly reflective and will not absorb radiant heat, but will direct it away from the house. Radiant barriers are usually used in hotter climates like Texas, and even more often if the cooling ducts are located in the attic of the home. Radiant heat moves in a straight line, away from a surface, and heats any solid materials that absorb its energy. The goal of installing radiant barriers in your attic is to reduce radiant heat gain. It should be installed in such a way that the accumulation of dust is minimized, because a dusty surface will reduce the reflective capabilities. Most of the time, it is the radiant energy from the sun that makes your roof so hot. The heat travels through the roof via conduction, then radiates into the attic, including the air ducts and the floor of the attic. When a radiant barrier is installed, the radiant heat transfer that comes from the underside of the roof is reduced and the surfaces of your attic are kept cooler. Radiant barriers usually work best when they are installed perpendicular to the radiant energy that is hitting it. 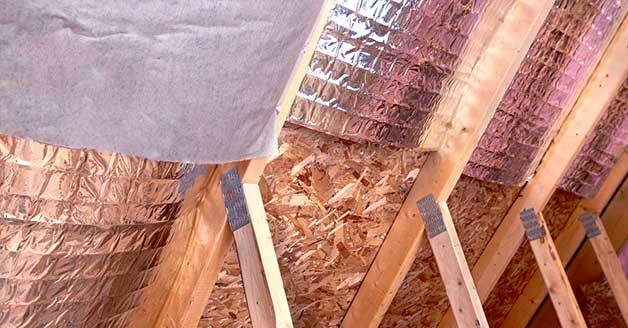 Even though a radiant barrier can be made of aluminum foil and cardboard, it must be installed correctly to derive the most benefit. A certified installer knows exactly where to place the barrier and in what position to maximize the reflective qualities and keep your home cooler. It’s also important to follow the local building codes and fire codes when installing a radiant barrier, which is another reason why professional installation is key. If you want to ensure that you aren’t adding to your cooling costs through your attic, call Affordable American Air Conditioning & Heating at 281-704-3696 today. We will inspect your attic and find a radiant barrier that works for your home in The Woodlands, TX.